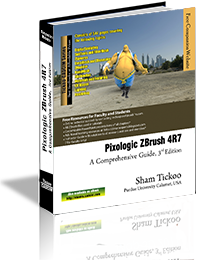 Pixologic ZBrush 4R8 is a powerful modeling and sculpting software developed by Pixologic Inc. This software is used for developing highly detailed characters for movies, games, and digital design projects. 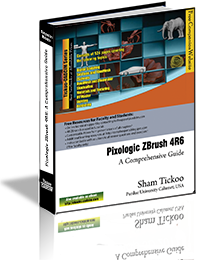 Pixologic ZBrush 4R8: A Comprehensive Guide textbook covers all features of ZBrush 4R8 in a simple, lucid, and comprehensive manner. 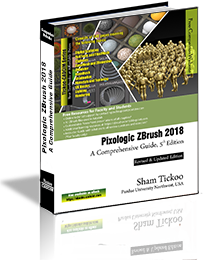 It gives in-depth details of the concepts and explains the usage and functions of ZBrush such as DynaMesh, NanoMesh, ZRemesher, ZModeler, NanoMesh, and KeyShot renderer. In this edition, new features such as Gizmo 3D and the Live Boolean mode, which is used to generate boolean results, have been explained. This textbook will unleash your creativity and transform your imagination into reality, thus helping you create realistic 3D models. 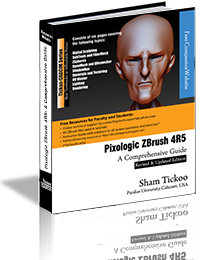 This textbook caters to the needs of both the novice and advanced users of ZBrush 4R8 and is ideally suited for learning at your convenience and at your pace. Consists of 12 chapters and 1 project that are organized in a pedagogical sequence covering various aspects of modeling, texturing, lighting, and animation. The first page of every chapter summarizes the topics that will be covered in it.